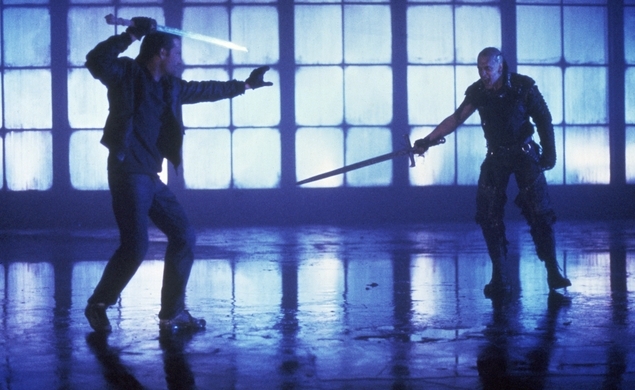 There’s a proposed Highlander reboot on the horizon, which is a little hard to imagine, because the original Highlander was so much a product of its era. It bridges the gap between 1980s epic period fantasy like Conan The Barbarian and Red Sonja, and 1980s tech-focused science fiction, like The Terminator and Blade Runner. It has so many signifiers of 1980s action-fantasy cheese, starting with the “stuff everything cool you can think of into one place” mishmash of genres and tropes. It has immortals sword-fighting to the death in a parking garage and a film studio. It has a heavy reliance on blue-black palettes and electric-effect mayhem. It has a grunting, bulky villain (a younger Clancy Brown) who gets off most of the film’s wry, funny lines. And it has Sean Connery as a 3,000-year-old Egyptian immortal running Christopher Lambert through the basics of being a sword-fighting survivalist immortal out to be the last of their kind. Oh, and it has an ebullient Queen soundtrack to ramp up the energy. It is thoroughly ridiculous. It is thoroughly badass. And it’s spawned some really awful sequels and spin-offs, but none of that matters to fans, who know there can be only one. The film airs at 7:15 p.m. and 11:15 p.m. Eastern tonight on HDNet Movies.